Iran’s supreme leader ayatollah Ali Khamenei, aged 78, has often been reported in the past five years to be suffering from failing health. It was usually suggested that he suffered from terminal prostate cancer and would soon be too ill to carry out his duties. Most of these reports proved to be exaggerated, either planted by political foes at home, or foreign agencies seeking to influence the course of events in Tehran. The ayatollah kept going regardless. But the latest reports appearing in August came from former Iranian President Abolhasan Bani Sadr, who has lived in exile in France since 1981 and well outside the hot pot of Iranian politics. He recently claimed that he had come across information that “moderates within the regime” and pro-Rouhani members had sent a secret message to Washington, which led Congress to postpone a vote on new sanctions until after the presidential elections in Iran in May. “This was the same message sent to Reagan at the end of Khomeini’s life,” Bani Sadr explained. The latest message demanded that President Donald Trump ease up on sanctions against Iran so as not to push the religious establishment into selecting a conservative successor to Rouhani, who was running for his second term. Bani-Sadr’s prognosis did not entirely hold up. After his re-election, the reputedly moderate, pro-Western Rouhani flirted for a while with his former foes, the hard-line Revolutionary Guards, although their relations later reverted to their former enmity. However a grain of truth was found in the Iranian exile’s account of the supreme leader’s fast declining health. DEBKA Weekly’s intelligence sources report that those foreign agencies which keep a close eye on the power games in Tehran have provided some corroboration. They affirm that Khamenei has not spoken in public for six weeks; nor has he held his regular meetings for shaping policy with top political, military and economic officials. They record his last public appearance as taking place on Aug.28, when he met with the Tehran clergy and made his “Nothing can be achieved without fighting” speech against the “terrorist” US and Israel. However, an examination of the film revealed that the speech was not delivered by Khamenei in person. A young priest seen from behind read out the written text, while the supreme leader sat propped up on a large pillow with his eyes closed and his head falling to one side. Intelligence watchers calculate that the last time the supreme leader was seen speaking at a public event was on April 25, when a group of officials and diplomats from Islamic countries visited him to celebrate Eid al-Mab’ath, the Muslim anniversary of Muhammad’s appointment to the Prophethood. 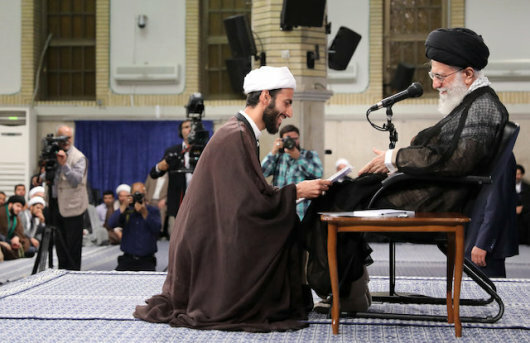 This 69-year old cleric is widely seen as Khamenei’s chosen successor. Shahroudi is an outspoken leader of the extremist camp. As head of Iran’s Judiciary from 1999 to 2009, his name reached the west in 2002, when he declared a moratorium on stoning as a form of capital punishment. But in 2009, he also tabled a bill in parliament that reduced the independence of Iran’s Bar Association. In the coming weeks, an avid watch will be kept on Khamenei to discover if his health is indeed fading as rapidly as widely suspected.